and we are one of the long standing companies approved by FIG. From top competitions to school education, the products lineup with the highest standards can fulfill a wide range of requirements. Senoh is proud of providing customers with the best quality that is absolutely safe and has a long life. 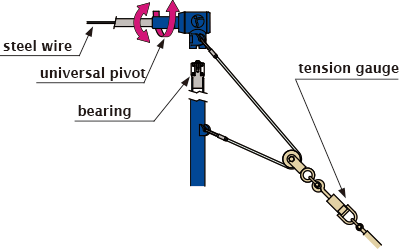 Universal pivot mechanism in free directions of bar deflection enhances performance level. A special steel wire runs inside of bar as safety precaution. 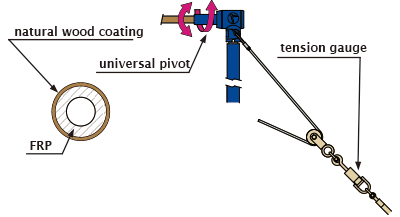 Smoothness is provided by bearing in uprights with multiplier effect of universal pivot. 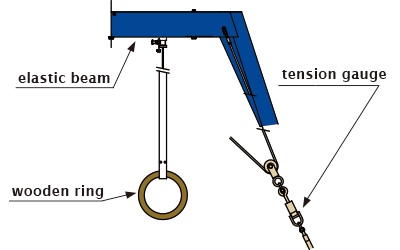 Visualized tension gauge attached to the wires delivers steady condition in Apparatus. Height is adjustable in 50mm pitch for all user. Sculptured ring made of compressed wood enhances performance level. Elasticity mechanism in upper beam reduces impact and injury risks. Enhance performance level through hygroscopic plastic pommel produced in unified molding. Special padding under cowhide leather cover reduces impact and injury risks. 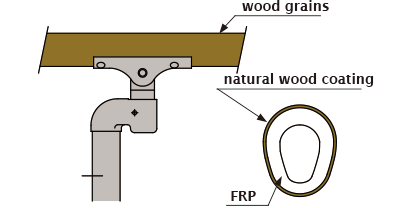 Elastic and durable FRP bar coated with 2mm natural wood enhances performance level. The bars are overlaid with wood grains and this helps magnesia powder remains on the surface. Height is adjustable in 50mm pitch is for all user. – high durable Intensified elastic panel with glass fiber. – Special developed cushions made by EVA . Enhance performance by adhesiveness of inner cushion with synthetic leather cover prevents slippage. Compressed high quality urethane foam is used as shock absorber at table front and reduces impact and injury risks. Two different density cushions with seamless vinyl chloride board inside to keep solidity and shock absorption together. 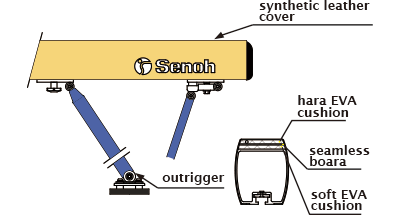 Outrigger base plate system allows various heignt adjustments depending on floor conditions. Safety conscious by wood grains on bars keep magnesia powder on the surface. A unified mat composed by a cover and cushion parts. For Horizontal Bar, Uneven Bars, and Vaulting, the confortable landing is produced by an alignment of cover joint is differently from which of under cushion. Carpet is specially developed for Gymnastics and combine the moderate slip and friction resistances. Superior in durability, shock absorbency, flexibility, and landing stability by multi density forms.